If someone had told my parents, thirty years ago, that they could put water in a bottle and charge people for it, they would have scoffed, and so would the rest of the world. But here we are in a world where bottled water is as common as Coke. And if someone had told me, fifteen years ago, that they could put flavorings and vitamins and minerals in bottled water and charge people three times as much as regular bottled water, I would have scoffed, and so would the rest of the world. But here we are in a world where flavored water is as common as plain water. And I say, hurrah! People have enough trouble staying hydrated as it is. In a perfect world we'd all chug down our 64 oz. every day, but to Gen-X'ers brought up on juice and softdrinks and flavored drinks, flavored water certainly makes things easier. It certainly helps us. Alfie and I discovered flavored water several years ago, and it's one of our little luxuries. We drink regular filtered tap water and we're not latte junkies, but danged if we each don't take our water bottles up to bed with us every night. Our latest find is Snapple's Antioxidant Water , which has all the trendy antioxidant berries like acai and (my favorite flavor) pomegranate. I hate ordering from chain pizza place without a coupon. If you're like me, click here for a Round Table Pizza coupon. Like most children, mine love cakes. They love drawing cakes, coloring them, playing with plastic versions of them, serving them, baking them... and (surprise, surprise) eating them. So it's not surprising that a book about a cake thief caught their attention right away. 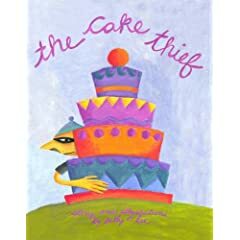 The Cake Thief, written and illustrated by Sally Lee, tells the story of Clarence, a little boy who lives with his cat and steals cakes for a living. His life changes one day when he is invited to a party and all he needs to do is bring a cake. It's a charming little tale about sharing, self-reliance and community spirit. Both I and my children loved this book. The story is as sweet as the delectable cake drawings throughout the beautifully illustrated book. It's simple and easy to understand, with just enough "naughtiness" to attract my kids. With a header like this, how can the bags not be cute? Pink Lemonade Boutique Bags sell hip, bongga diaper bags that transition into tote bags as your baby gets older. Their Retro Black Pink Stripes design is as cute as can be. Island Life is giving away one of their fabulous bags, so hop on over and sign up! Grab my blog buttons and post them on your own blog for extra entries in my giveaways! Here are some rules that apply to all my giveaways (unless stated otherwise in the specific giveaway). By entering a giveaway, entrants agree to comply by the terms of the giveaway as stated here and on the giveaway post. * Unless otherwise stated in a specific giveaway post, giveaways are open only to continental US residents. * The basic method for entering a giveaway is to leave a comment on the giveaway post. Note that the giveaway may specify additional criteria for a valid entry (ex: visiting the sponsor's site, commenting about sponsor's other products, joining a mailing list, etc...), and occasionally a giveaway may require other methods of entry (ex: becoming a fan of the sponsor on Facebook, creating an account on the sponsor's site, etc..). The entry method will be clearly described on the giveaway post. * Please make sure I have some way of contacting you (email address, blog URL, etc..). * No extra entries - unless the giveaway specifies ways you can earn an extra entry (ex: blogging about the giveaway, subscribing to my RSS feed, etc...). No duplicate entries; each extra entry method can only be done once. * Entries will be accepted until the giveaway end date. Entries submitted after the giveaway end date are not valid. * I will draw the winning entry at 12:01AM on the giveaway end date, using random.org to get a random number n. The winner will be the nth comment. * I will make every effort to contact giveaway winners via email and/or twitter. I am not responsible for incorrect email addresses you leave on my blog. I am not responsible if my email to you is routed to your spam folder. To prevent this from happening, you may wish to add bonggamom@yahoo.com to your email address book. * Winners have 48 hours from the time I email to confirm acceptance of their prize and send their mailing information at bonggamom@yahoo.com. If I do not receive this information from the winner within 2 days, I reserve the right to draw another winner from the pool of comments. * I will post the winner's name on the comments section of the giveaway post after the winner confirms acceptance. * Occasionally, giveaway prizes may be subject to availability. In the rare case that the original prize is no longer available, Bonggamom Finds and the sponsoring company reserve the right to substitute a prize of equal value. * Please be aware that prize fulfillment may take as long as 6-8 weeks, and in certain cases, longer. * I am not liable or responsible for any loss or damage of giveaway prizes sent through the mail, whether the item is sent directly by me, or sent by the giveaway sponsor. * Neither I nor the giveaway sponsor are liable or responsible for any loss or damage resulting from winner's use of the giveaway prize. * Although giveaway prizes are usually provided by a sponsoring company, Bonggamom Finds is responsible for administering all giveaways on this blog. Please direct all giveaway-related questions, comments and complaints to bonggamom@yahoo.com, not to the sponsoring company. Hi, I'm Bonggamom and this is my new blog, Bonggamom Findings. I've been toying with the idea of starting this site for quite a while now. From time to time, I've blogged about products I like, books I've read, blogs I've visited and coupons I've used on my personal blog, Finding Bonggamom. I've decided to voice those sorts of opinions on a separate site -- Bonggamom Findings -- so I can devote Finding Bonggamom to stories and reflections on my life. I'm sure there will always be some overlap between the two blogs, but this is where you'll find my take on stuff I've deemed to be Bongga -- or not so Bongga. So without further ado: Welcome, good to see you, hope you come back, all that stuff -- and let the opinions begin!